When The Force Awakens came out, people were mad that it was too much like the old Star Wars; after The Last Jedi, they're mad that it wasn't enough like their fanfic. After tragedy destroyed his attempt to rebuild the Jedi Knights, Luke Skywalker vanished from the galaxy. Now the Resistance needs his help to thwart the efforts of the evil First Order. Last Jedi did two things wrong: first, it had the temerity to portray Luke Skywalker as a real human character, and not the overpowered Mary Sue he'd been in the original trilogy; and secondly, it suggested that maybe blindly honoring the past isn't a good thing, especially when the past is holding you back. It deconstructed the idea of the Jedi as perfect. Imagine if Christianity looked at itself and said, "Hey, you know, some of this stuff in the book is wrong and outdated. And the good stuff, we've done a crappy job of following that. Let's rethink." The absolute worst people in the world would get pissed about that, right? Same thing with Star Wars. Luke is played by Mark Hamill, best known for his role in the Wing Commander series. 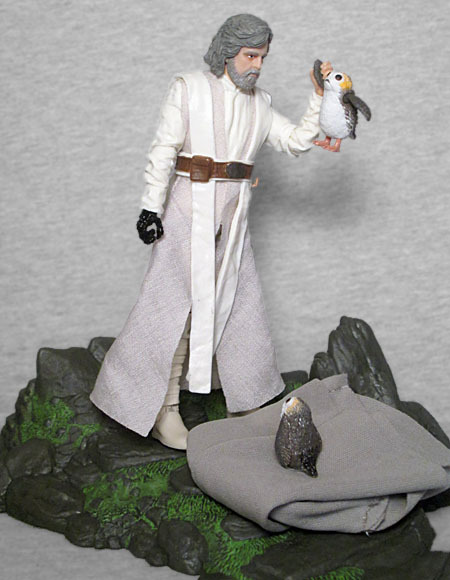 The figure's likeness is quite realistic, even behind the shaggy hair and the bushy Obi-Wan beard. There are bags under his eyes and his cheeks are sunken, but all in all, he still looks pretty good for a guy who's been hermitting it up on Fish-Nun Island for a decade or so. Despite leaving the Jedi Order behind, Luke still dresses like them: his robes are closer to white than tan, but he's still got the same sort of layers they'd been wearing for years: shirt, multiple robes, tabard, sash, all that. 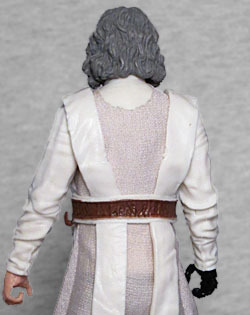 On the normal figure, the robes are all molded PVC, but this is a Target exclusive, and one of the differences between it and the mass market release (other than the fact that the exclusive is about 100 times easier to find) is that here we get a softgoods robe. It's just the tan one - the white bands over the shoulders and the sash/belt combo are still plastic, used to hold the robe on. By making only one particu;ar garment out of many softgoods, it prevents there from being an obvious disconnect between sculpt and fabric. It also really helps with the articulation. 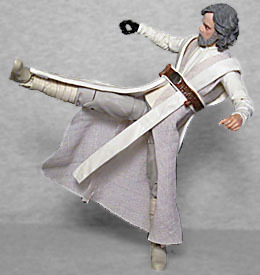 Like most Black Series figures, Jedi Master Luke has swivel/hinge rocker ankles, double-hinged knees, swivel thighs, balljointed hips and torso, swivel/hinge wrists, elbows and shoulders, a hinged neck, and a balljointed head. With the plastic robes, the mass market version's legs can't really move very far - but turn those same robes into cloth, and suddenly he can do all the high kicks you want! 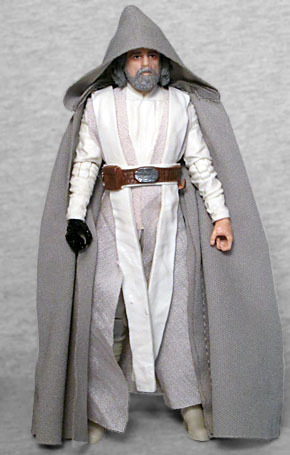 Retail Luke only has one accessory, his outer robe. It's a pale tan and made from fabric, and this figure gets it too. There's a hook on his belt, but he doesn't actually come with his lightsaber hilt - for that, you'll have to get Maz Kanata or one of the Reys. Exclusive Luke does get something else though! It's an alternate version of his mechanical right hand, curled into a fist rather than being open to grip something. That seems like a pretty minor change, and it really is. There was no need to include that. So why did they, then? Because with it, they could tout the fact that Luke has "die cast fetaures" - the fist is real metal, and swaps out at the wrist. 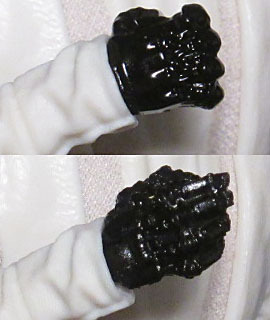 There's a good level of detail in the sculpt on both hands (though it's clearly going to be better in plastic than in steel). Like the last movie's "Starkiller Base" Kylo Ren, this figures includes a scenic diorama. As you may have been able to surmise, his represents Ahch-To, the wind-swept island where he's sequestered himself. It's a rather sizeable chunk: the shape of it is irregular, so it's hard to give an accurate measurement, but figure it's at least 7" in both directions. The design is a bit of walkway, with flat stones leading from front to back. At one end, they're right down against the ground (or the shelf, or the desk, or wherever you choose to display him) and then they rise toward a short cliff at the other. 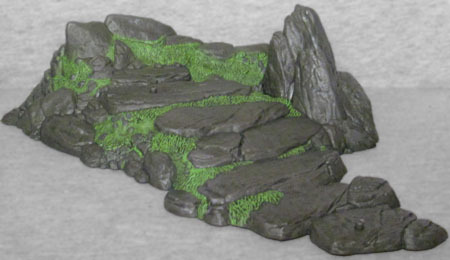 On the side are a few standing stones, breaking up the pattern, and expertly sculpted grass peeks out amongst the crags. It's an absolutely lovely piece, and the only thing missing are some porgs. There are foot pegs at both ends of the walkway - presumably so you can have Luke at one end and Rey at the other, re-creating the final shot of Force Awakens. There is a "Jedi Training" Rey exclusive, available (for now) at Toys Я Us, but her base represents Crait, so it clearly isn't meant to pair with this release. The friendless MRAs who hated Last Jedi love to latch onto the fact that Mark Hamill said he didn't agree with director Rian Johnson's plans for Luke, while conveniently ignoring the fact that he went on to say that his first impression was wrong, and to praise what Johnson did with Luke. Because if you're going to ignore new information in order to cling desperately to your existing notions in regards to a film story, you might as well do it in real life, too, right? The Last Jedi dethroned Empire as the best Star Wars movie, its version of Luke was really the only way to grow the character, and this Target exclusive toy is the best version of him. Now: any chance we'll see a "Crait Battle" version of him, too?